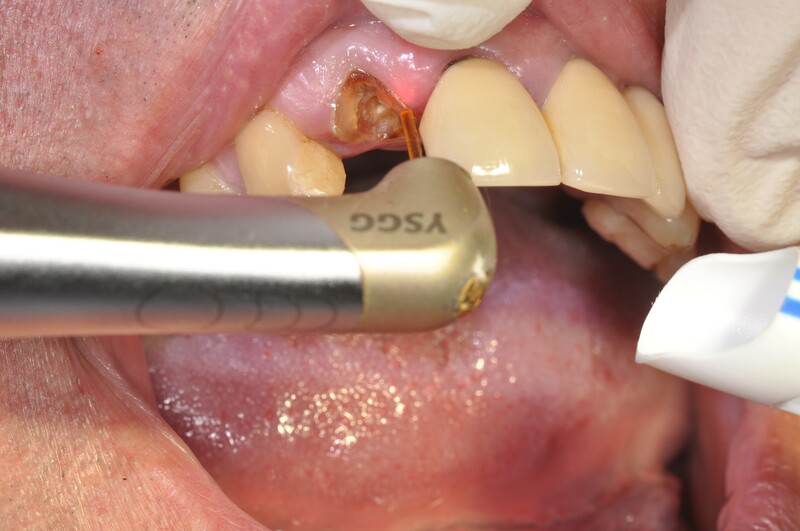 Mustafa Mukhaiber presents a case using dental lasers to perform single tooth crown lengthening. Lasers in dentistry can be divided into two main types: soft tissue lasers and hard tissue lasers. The laser used in this case is the Er,Cr:YSGG 2780nm I Plus Waterlase by Biolase, which is used for hard and soft tissue removal due to its high peak power. 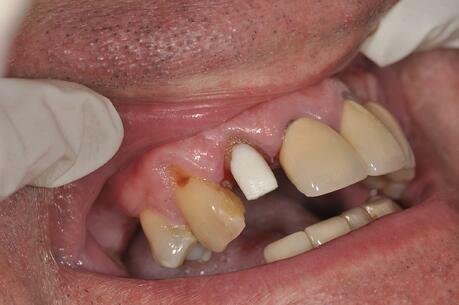 The use of the laser in this case was to perform single tooth crown lengthening for restorative purpose. The aim of using the laser was to increase the clinical crown length of the UR2 tooth by apically positioning the gingival margin and the supporting crestal bone. This procedure could also be used to increase the crown height in cases of wear of the teeth, or to have a better access to subgingival root caries, or to remove the margins of the bone impinging on the biologic width of a crown, or to create a 2mm ferrule effect for a post crown to increase the success rate of a crown. There are many disadvantages of the conventional crown lengthening procedure, which requires a mucoperosteal flap to expose the bone and also the use of a surgical handpiece with a round bur for the removal of the alveolar crest. For the gingivectomy the use of a surgical knife will result in bleeding from the gingival margin, and the patient will need suturing at the end of the procedure. The use of local anaesthesia is essential, and usually the patient will suffer from postoperative swelling and discomfort. The advantages of using the laser in this case are many; there is no need to use local anaesthesia at all, there is no bleeding during or after the procedure, and no need to use sutures as the laser used in closed procedure. Additionally, there is no postoperative swelling or discomfort. A 59-year-old fit and healthy consultant surgeon attended the practice complaining from loose UR2. 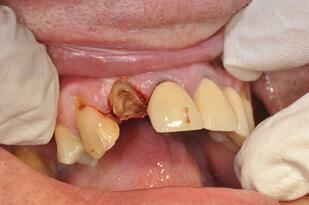 The patient wanted to save the tooth. 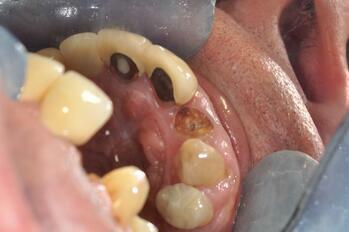 IOPA showed the UR2 with a good root canal treatment and a dentate screw. 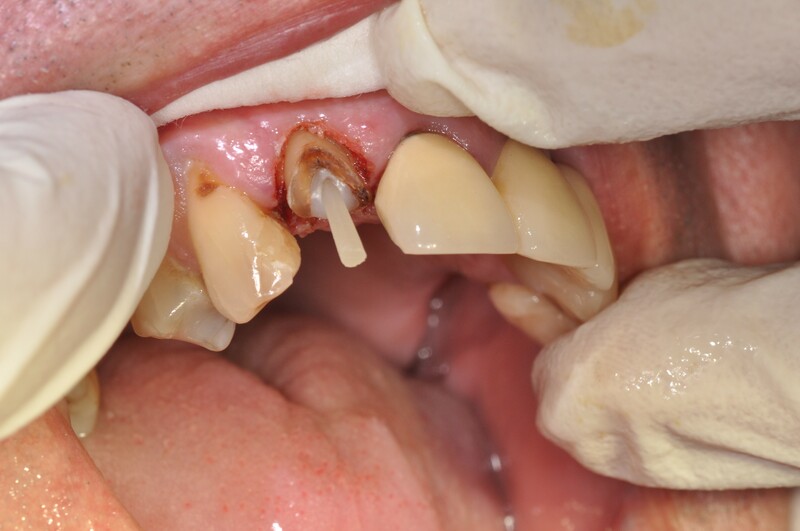 A decision was made to remove the dentated screw and replace it with a fibre post and to perform a crown lengthening procedure with the use of the Er,Cr:YSGG I Plus laser by Biolase. The patient attended for an assessment appointment. 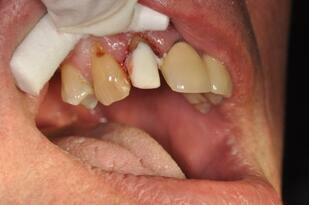 Several factors can affect the success of this procedure, therefore a good preoperative assessment was essential. A thin bio type gingiva could result in more recession than the thick bio type. 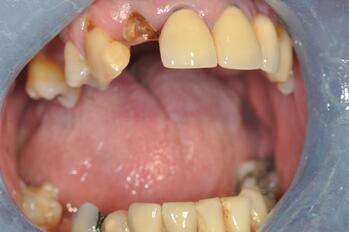 In this case the patient had a thick bio type gingiva. 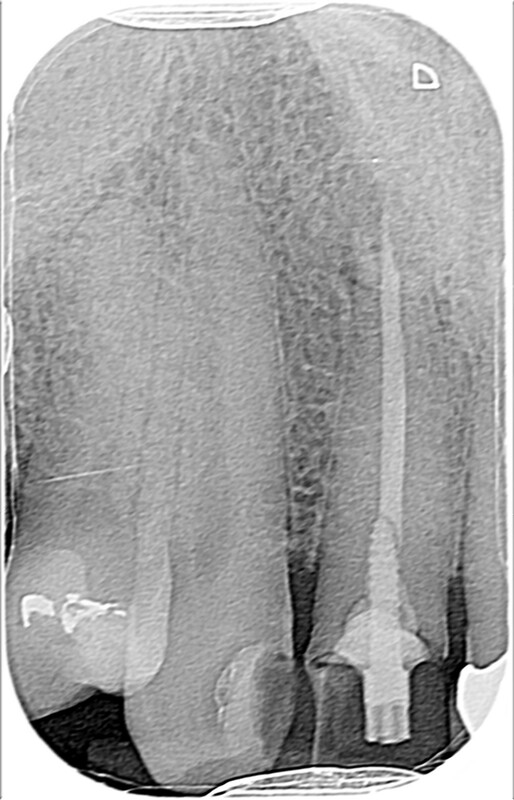 A minimum of a 1:1 of root to crown ratio is essential to the success rate of such a procedure. In this case the root length was favourable. 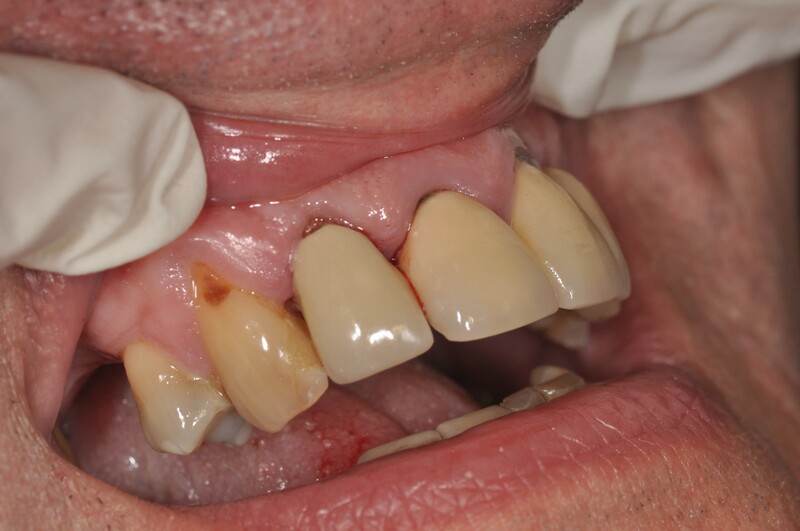 The consideration of the biologic width is so important in crown lengthening procedure. Biologic width can be defined as the dimension of soft tissue that is attached to the portion of the tooth coronal to the alveolar bone crest. A minimum of 3mm of space between restorative margins and alveolar bone would be adequate for periodontal health, allowing for 2mm of biologic width space and 1mm for sulcus depth. 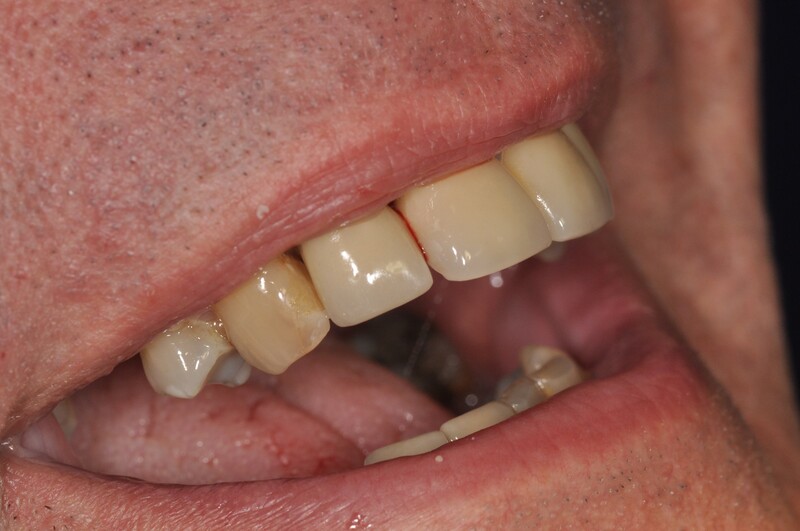 Other factors was considered in this case included: the length of the post, ferrule effect, thickness of the buccal bone, width of the keratinised gingiva, and the patient lip line. No local anaesthesia was needed for this procedure. The treatment protocol for the Er,Cr:YSGG is as follows: this is a 2870nm mid infrared wavelength laser, and the setting of such a laser is different for removal of gingival tissue and that of removal of bone. Non-contact: the tip of the laser not in contact about 2mm away from the bone margin. Contact: the laser tip is in contact with the tissue. After the use of the laser to expose more root surface, a new post was inserted (DT light fibre post) and cemented with Unicem Relyx. This is followed by core build-up procedure by first preparing the surface of the tooth with an acid etch and bonding system according to the instruction, to bond the para core material to the tooth surface. 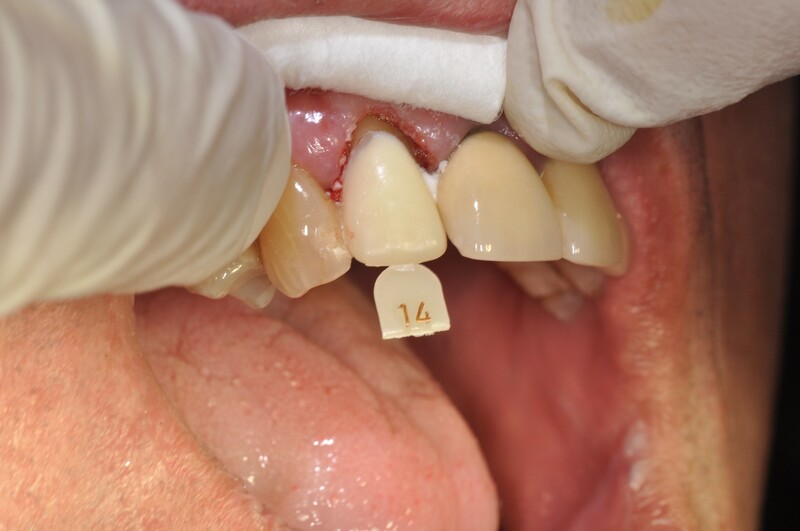 This was followed by checking the size of a Directa temporary crown and filling and the temporary crown with the para core material. Placement of the temporary crown over the tooth results in the core taking the shape of the inside of the temporary crown, which will be similar to prepared tooth for a crown. A slight adjustment of the core was made to prepare the tooth for the porcelain fused to metal crown and the temporary crown was cemented with Temp Bond. 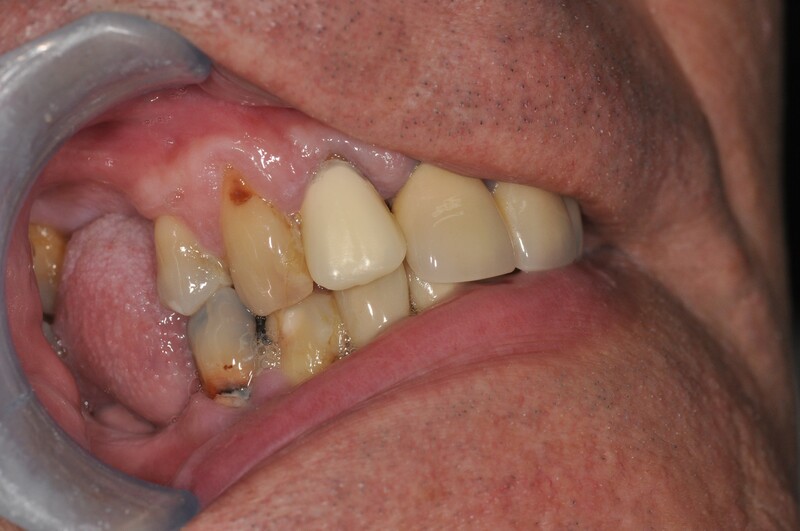 At the final appointment, the gingival tissue was assessed for any reception or relapse of the gingival tissue. The healing of the area was uneventful. 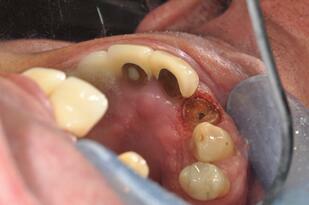 This was followed by the removal of the temporary crown and cementing the final crown. The use of the laser in crown lengthening procedure is easy and with several advantages. No local anaesthesia is used during the procedure and the postoperative healing is faster than the conventional method of crown lengthening. Browse our selection of Biolase products here https://optident.co.uk/manufacturer/biolase/ or alternatively get in touch with sales@optident.co.uk.